I don’t mean to go all Editor & Publisher on you, but I had to point out this Pinehurst ad in this month’s issue of ClubCorp’s Private Clubs Magazine. When you’ve been in the business for more than two decades, including 10 years in magazines, these are the things you notice. This appears in the first few pages of the magazine,and it just stops you. 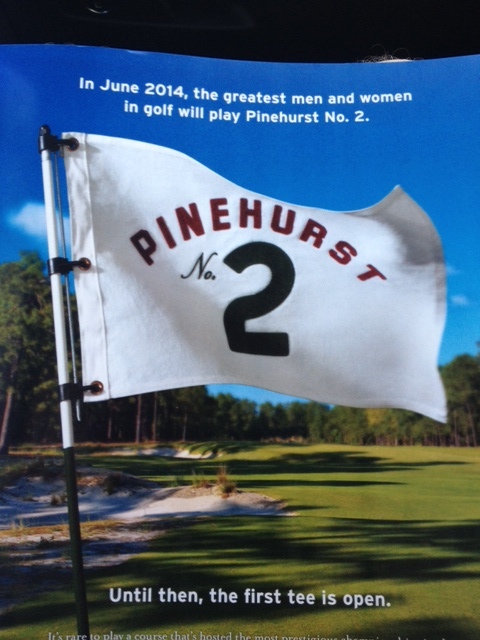 It’s a clean ad with a tremendous photo and smart copy that promotes Pinehurst No. 2 hosting both the men’s and women’s U.S. Open this year. A simple yet brilliant play on golfers’ desire to follow in the footsteps of the pros – or precede them. This ad makes me want to get on plane tomorrow. Now that’s a good ad. Of local note, Scott Slater of San Diego hamburger fame as the owner of Slater’s 50/50, is also featured in the issue, which reminds that I need to get back to Slater’s. The only time I’ve been there I had no advance notice about what a goliath of a hamburger I would be served, and I was defeated soundly by a very tasty burger. A rematch is mandatory, preferably after a suitable fast. Slater is a ClubCorp member at the University Club atop Symphony Towers, thus meriting the profile. This entry was tagged ClubCorp Magazine, Pinehurst, Scott Slater, Slater's 50/50, U.S. Open. Bookmark the permalink.